Under the Shang Dynasty, about 2000 BC, people in China began to ride in chariots pulled by horses. 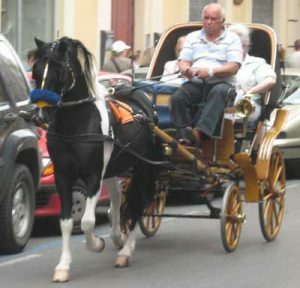 See if you can find any place near you that gives rides in horse-drawn carriages, and take a ride in one, to see what it is like. How fast does the horse and carriage go? Is it faster than running? As fast as a bicycle? As fast as a car? What did you like about it? What didn’t you like? Cite this page: Carr, K.E. Horse and Carriage Project – Chinese History. Quatr.us Study Guides, June 6, 2017. Web. April 19, 2019.